In this volume, highly esteemed scholar Kevin Vanhoozer introduces readers to a way of thinking about Christian theology that takes the work he began in the groundbreaking 2005 book, The Drama of Doctrine, to its next level. Vanhoozer argues that theology is not merely a set of cognitive beliefs, but is also something we do that involves speech and action alike. He uses a theatrical model to explain the ways in which doctrine shapes Christian understanding and forms disciples. The church, Vanhoozer posits, is the preeminent theater where the gospel is "performed," with doctrine directing this performance. Doctrines are not simply truths to be stored, shelved, and stacked, but indications and directions to be followed, practiced, and enacted. In "performing" doctrine, Christians are shaped into active disciples of Jesus Christ. He goes on to examine the state of the church in today's world and explores how disciples can do or perform doctrine. Written in an accessible and engaging style, Faith Speaking Understanding sets forth a compelling vision of what the church is and what it should be doing, and demonstrates the importance of Christian doctrine for this mission. Disciples who want to follow Christ in all situations need doctrinal direction as they walk onto the social stage in the great theater of the world. The Christian faith is about acknowledging, and participating in, the great thing God is doing in our world: making all things new in Christ through the Holy Spirit. Doctrine ministers understanding: of God, of the drama of redemption, of the church as a company of faithful players, and of individual actors, all of whom have important roles to play. In an age where things fall apart and centers fail to hold, doctrine centers us in Jesus Christ, in whom all things hold together. CLICK HERE to read the introduction! "Rooted in acute theological intelligence, pervaded by a conviction that faith and the practices of faith are inseparable, and written with verve, Faith Speaking Understanding is a work of alert and engaged Christian reflection that will attract wide consideration." "This book is a model of doing theology in the service of the church. Building on his well-known construal of theology as theodrama, Vanhoozer presents the church as the theater of the gospel, a place where observers are participants and where theology and ethics, contemplation and action, surrender and obedience, and James and Paul are no longer enemies but allies. A wonderful theological essay by a brilliant evangelical thinker." "This is vintage Vanhoozer—highly intelligent, wonderfully resonant, almost painfully true to the gospel and to life in the church. Vanhoozer often addresses other theologians: this time he addresses everybody who cares about following Jesus. Faith Speaking Understanding is mighty and prophetic, and, like Jesus, it is full of grace as well as truth. Brilliant work!" 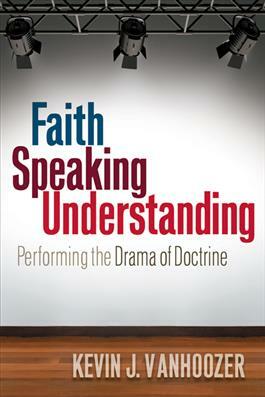 "With his extraordinarily imaginative energy, Kevin Vanhoozer's Faith Speaking Understanding builds on his equally energetic The Drama of Doctrine to help us see how doctrine, like stage direction, helps us live truthfully to the gospel. Without fail, Vanhoozer vivifies the fundamental convictions of Christians by articulating their dramatic character. I suspect this is a book that will soon be deemed a classic."